I add this new little template set to the shopsite this evening. Thanks to Paolo for ideas and help with this! This double thickness template set is similar to the "Narrower" template, however the square in this set is smaller. It is used to narrower the graver too, but so that it closer to parallel with the shank, so that the grind is more long and slender. After the square template is used, the round is used to round the top edge of the slender shank. After this the graver is sharpened normally with the other available templates to make micro versions of the graver points. The wrench are setscrew are provided to replace the thumbscrew in the sharpening fixture. This is needed to be done before using these templates because they grind so low that the thumbscrew will be in the way if it is not removed. Simple remove the thumbscrew and install the setscrew with the supplied wrench. Of course, when you finish with shaping a graver shank with these templates you may reinstall the thumbscrew. Nice. That will be very useful. Steve hold my order, could you please call me I want this set also was unaware you had it available. Hi Carlos, I saw your order last night. I was going to wait and give you a call. I'll try you this afternoon. Paolo made a new video showing what he his doing with the templates. Hi Paolo. Interestingly, these new cutters work well inside the ring? ordered the set and the narrower also. Can wait or it ti get here! That is very cool I must say! That is really some fine micro-work with the microgravers,Awesome ! Neat! That is tiny Paolo. What is the diameter of it? I think in inches and smidgets. 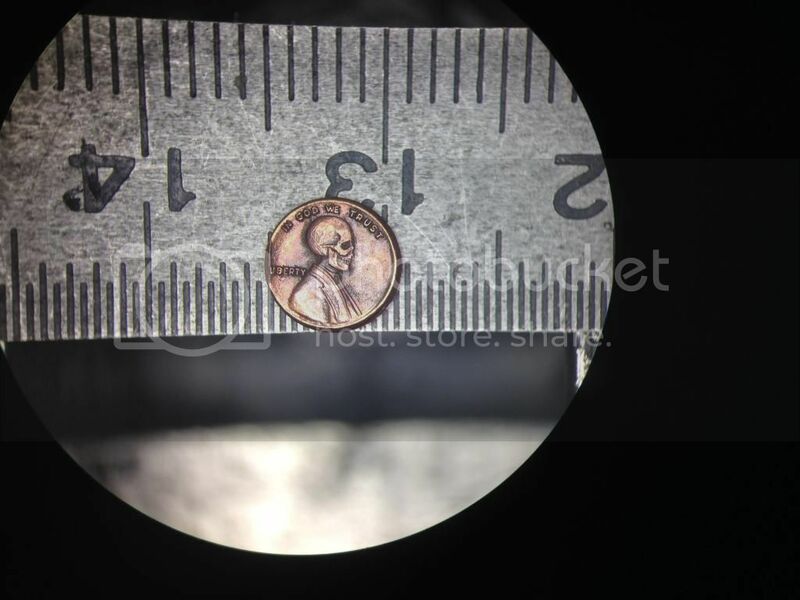 The skull at 2mm would be .078". Just a smidget over 1/16". That is a little skull! It's the lettering that's most impressive to me. Got my set today......Gonna put it to use immediatly..
Did I miss the part of why the two pins in each one.... ?? I believe the two pins are the same as on the Narrower set - one pin to be square to the sides of the blank and one to be at 45 degrees to the sides. Hi SVD and CJ, In these template there are two pins to locate the double templates together. One pin protrudes and the other is recessed. No need to move them and you use as they are shipped. I "KNOW" the new coin holders are somewhere in the Mail......huh......?? Ah, so you set up with the square template, grind the graver down small and then add on the round bit to use to round off the top of the (now) micro shank. Is that correct? How in the heck did you hold that tiny...tiny coin? That is way to cool! Not sure how is called in english... stone setting pitch? 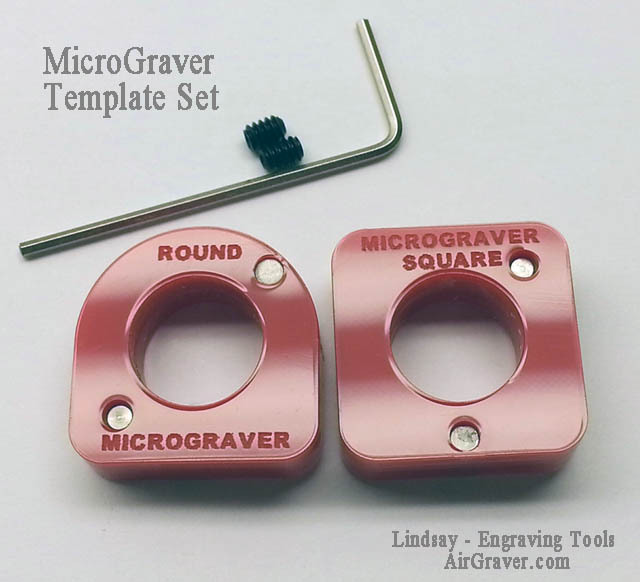 Looking at the micrograver sharpening templates, I have a couple of dumb questions as soon as I saw the gravers. The final graver diameters look to be about .040" to 1,5mm in thickness, and quite fragile concerning a length to diameter ratio. Unless you have a bomb disposal touch, I can envision many snapping at the point where the grind terminates at the 3/32" shank. Would it be prudent to grind the reduced length barely enough to clear the work, if rubbing of the handle or fingers isn't a problem? I am also guessing that you'd want to use as coarse as possible a disc, with a ginger touch, except for the semi and final grinds on the business end, and they also would need the most delicate of handling techniques. However, the templates seem like a nifty idea, and I couldn't see an easier way to obtain the grinds without using the templates Steve offers. Many sewing machine needles are heat treated, and nickel plated. Needles for leather and boatsail canvas are quite strong, but will flex. Until I'd try out these, it's seems that there'd be a learning curve involved. It's just my opinion. Now that I have my set in hand I understand. The second pin isn't a 'real' pin like we're used to. It's a structural element used to hold the two halves of the double thick templates together. Hi Katgraver, I missed your post earlier. Thank you Paolo for posting and helping! For my 'test' of the micro template I just reduced the blank to about 1/16". Makes a great 105 for doing Fine English Scroll. Need to take the time to do a real micro graver - just too many other things in the queue right now.